Choosing a swimming pool depth may be the most important decision a customer makes when building a pool. This determines how their pool is going to be used. For years we all grew up with pools that were shallow on one end and deep at the other with a diving board. Today’s pools are much different, in fact very few pools are still built with a diving board. A lot of new swimming pool builds are done in what is called a sports configuration. In a sports configuration there is a shallow end on both sides, and it slopes a little deeper in the middle usually down to 5 feet. This configuration allows for activities in the pool like volleyball, basketball, beverage drinking, aerobics, or any number of games and activities that require being able to stand. The reason this has become so much more popular than the traditional pool is, if you take diving out of the equation, everything else you do in a pool can be done in 5 feet of water or less. A traditional 32 foot pool engulfs the first 21 feet of pool water over the top of everyone’s head. Because of this, a standard size pool of 32 feet long designates over 2/3 of the pool to diving and treading water. Keep in mind, 90% of the time you will spend in a pool, you will be standing because nobody treads water all day. That is why most of the time we recommend a 5 foot maximum depth regardless of whether you go with a sports or more traditional slope configuration in your swimming pool build. For these reasons we find shallow pools to be a more economically sound, family friendly, and practical investment. In order to have a really nice diving pool one would need a large backyard and larger budget. This would allow for a very large pool which could properly accommodate the diving area, shallow water activities, and lounging everyone enjoys. Copyright 2017. 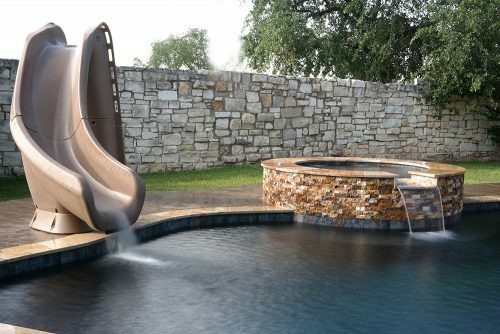 Reliant Pools | Pool Builders Austin Texas. All Rights Reserved.